I. Lopez-Galilea, J. Koßmann, A. Kostka, R. Drautz, L. Mujica Roncery, T. Hammerschmidt, S. Huth, W. Theisen. 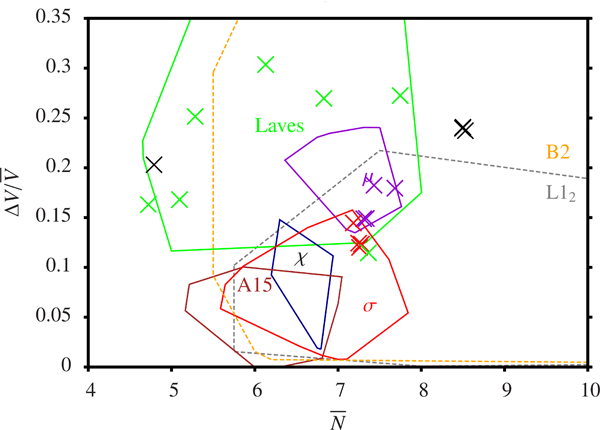 Analysis of experimentally observed precipitates of topologically close-packed phases in heat-treated Ni-base superalloy ERBO1 in terms of a structure map using average number of valence electrons (N) and differences in atomic size (V). The crosses mark local chemical compositions of the precipitates obtained by TEM. In Ni-base superalloys, the addition of refractory elements such as Cr, Mo, Co, W, and Re is necessary to increase the creep resistance. Nevertheless, these elements induce the formation of different kinds of intermetallic phases, namely, the topologically close-packed (TCP) phases. This work focuses on intermetallic phases present in the second-generation single-crystal (SX) Ni-base superalloy ERBO/1. In the as-cast condition, the typical γ/γ′ structure is accompanied by undesirable intermetallic phases located in the interdendritic regions. The nature of these precipitates as well as their thermal stability between 800 and 1200 °C has been investigated by isothermal heat treatments. The investigation techniques include DSC, SEM, EDX, and TEM. The experimental information is complemented by (1) comparison with a structure map to link the local chemical composition with phase stability, as well as (2) thermodynamic calculations based on the CALPHAD method to determine the occurrence and composition of phases during solidification and in equilibrium conditions. The TCP phases Laves, µ and σ were identified in various temperature/time ranges.